It's time again for Secret Recipe Club (Secret Recipe Club) reveal! My secret blog assignment this month was Jessie Weaver the Vanderbilt Wife. Jessie is a Tennessee wife and mother who leads a crazy, busy life - but then, who wouldn't with three little kids? Check out this 'day in the life' post if you don't believe me. I'm pretty sure we've all been there! Somehow, amidst the fun of raising those adorable children, Jessie still finds time to cook and post some great recipes. Whether the kids will eat them or not is another thing altogether. Me? I found plenty I wanted to try, including Slow Cooker Taco Soup, Easy Pineapple Chicken, and Cranberry Nutmeg Breakfast Cake. 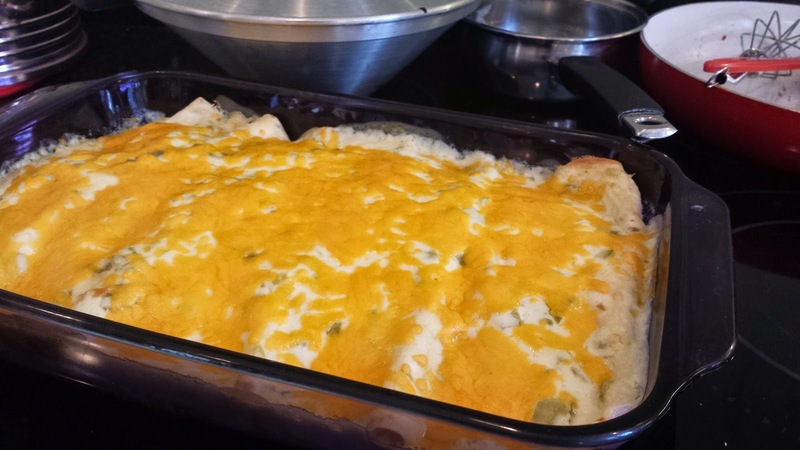 I finally decided to make these enchiladas, and they were a big hit! My parents were visiting, so we had them for dinner last weekend - twice! And the leftovers were just as good as the first time around. I will definitely be making these again. Saute onions until tender, then add shredded turkey or chicken and cook for a few minutes. Stir in salsa and heat through. 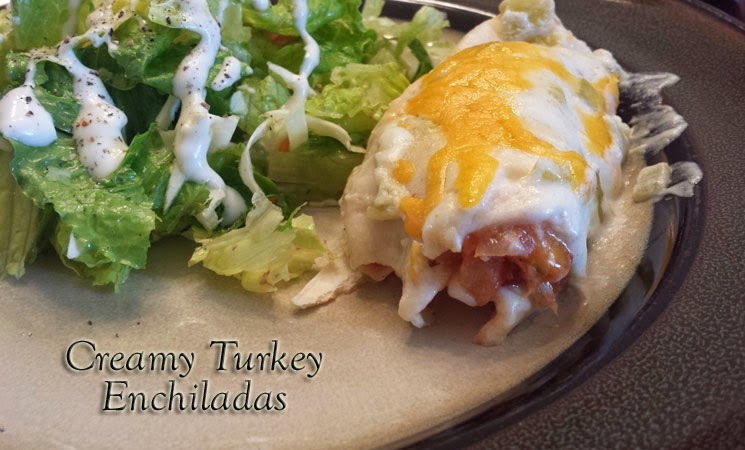 Divide chicken mixture into tortillas and top each with 1 T cheese. Roll the tortillas up and place them seam down in 13x9" baking dish. In saucepan, melt butter with bouillon cube, then whisk in flour. Stir in water. Cook and stir until thickened and bubbly, then stir in chiles. Remove from heat and stir in sour cream. Pour the sauce over rolled enchiladas in baking dish. Cook at 350° for 15 minutes. Sprinkle with remaining cheese and bake an additional 5 minutes or so, or until cheese is melted. Jessie's recipe can also be made with 1 lb. ground beef instead of the turkey or chicken. Just brown the beef with the onions and drain any fat before adding the salsa. I used turkey because that's what I had in my freezer, and I pretty much use chicken and turkey interchangeably, so either would be good. The sauce on top is what really makes these special - so creamy and good! - and it's really simple to make. Thanks, Jessie, for sharing your family recipe. My family loved it!